If you are tired of the daily grind and ready to pursue your passion for writing, you may feel that now’s the right time to jump into freelance writing. Freelance writing is one of the most legit work-from-home jobs you’ll find, and it can turn into a very lucrative career – especially if you snag a steady stream of high-paying assignments. However, the income isn’t always consistent, and many times, it’s feast or famine. But, don’t let the financial reality scare you back to the office. The truth is, many people are able to make a career of freelance writing – where they’re able to sit home in front of their computers and be creative. Like any major career transition, there is a wrong and a right way to move forward. You may feel that a leap of faith is the best approach. You know, where you quit your job and take a chance. This may work for some. However, if you don’t want to return to the workforce six months after launching your career, you need a financial plan. The bills don’t stop after starting a freelance writing career. And yes, things may be a little tight in the beginning. But with a financial cushion and self-motivation, you might just make it work. Yes, you’re frustrated. And yes, your boss is getting on your nerves. But even if you have the skills and the self-discipline to be a freelance writer, it can take several months to build a steady stream of clients. For a smooth transition, build your client base while you’re still employed. Things might get a little hectic as you juggle freelance writing assignments with full-time employment, but when you’re ready to quit your job, this approach ensures steady income. Don’t rely on your emergency fund to stay afloat after quitting your job. This account is for emergencies only. Before launching your freelance writing career, start a separate bank account – your transition fund. Since you’ll be completing freelance assignments and working full-time in the beginning, take all of your freelance writing income and deposit it into this savings account. If you’re sick of the low interest rates that banks are currently paying, check out bank interest rates for CDs. Whatever you decide, make sure that you have the extra cash to pull you through the months where work may be slim. To make the transition from full-time worker to freelance writer easier, you must relinquish the sources that take your money in the first place. Try to pay off your bills as soon as you can. Develop a plan to pay down your debt. The less you owe, the easier it’ll be to start your new career. Join me for my FREE Live Webinar – Build a Six-Figure Writing Career. I’ll give you all the tips you need to get started making money as a writer. Follow the link above for details! What tips do you have for someone who may be thinking of starting a freelance career? I love the advice to have saving ON TOP OF your e-fund. That’s such an important point. As you say, your e-fund is for emergencies, not planned events. Great post, Holly! While I am not a freelancer, I agree with your tips. If I was ever going to full-time freelancing, I would wait as long as I possibly could to quit my job as well as build a big savings cushion. I hope you write more about this topic in the future, it’s one of my favorites. I think that waiting to quit your job is a good thing…but I almost feel that I waited too long to quit my job. These are the things I’ve been working on. I feel like I have enough work to pay my bills but of course it’s still scary. My emergency fund is almost complete and then I am going to build a cushion of a couple months worth of pay to help out when times get tough. And, I want to diversify my income so it doesn’t all come from one main client. Yep, it sounds like you’re on track! Awesome post, Holly. I would say too, that in addition to not creating extra bills, it’s important to reduce expenses where possible in anticipation of decreased income. Work before quitting your job to cut cable, reduce your grocery bill, etc. 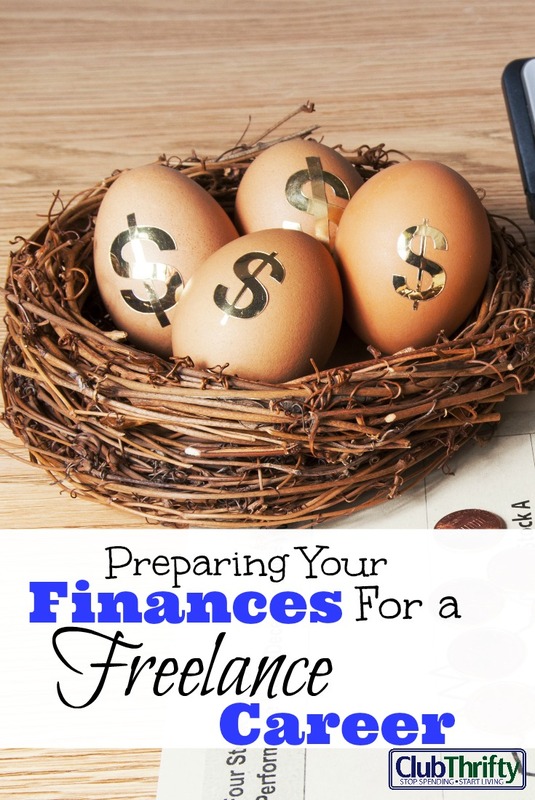 Better safe, and you can always add more cash into these areas after you’ve got a firmer idea of what your freelancing income range will be. An alternative option is to have a high earning spouse and to quit immediately. That would be the ideal way to do it. If you can live on one income, you have a lot more options period. Great tips Holly! We did all of them before I took the plunge. It sucked staying on the job until I could leave, but it was important to continue to build up our cash reserve. Having that access to cash is so vital as you never know when you’ll hit a dry patch. Great tips Holly! I’ve started freelancing a couple months ago and it’s already gotten a little difficult to manage with a full time job but I’m making it work until I have a sizable emergency fund and feel comfortable taking the plunge. Great tips…it is definitely important to have an emergency fund and savings when income can be sporadic. P.S: I finally got to reading my Kiplinger’s September issue…you have a lovely family! Definitely have an emergency fund and test the waters first. It may take months or even years before you make enough to live off of. These are all spot on tips. The best one I have is don’t quit your job until you know you can handle it. No one needs the added stress. I would think you’d need to know your necessary expenses backward and forward and have a bare minimum you could cut to if it came to that. That’s also a great plan to have a provisional account besides your efund. I would do that with any job change. I love that Greg was able to try something new then find a new job and it didn’t affect your finances at all. Me too….BUT I am very ready for him to start earning again. His starts getting paychecks either next Friday or the one after that! These are great tips. I don’t think I’d be able to go to full-time freelance until I knew that I could make enough money, even on low months, to cover off on all of my expenses. I don’t want to have to have the high months in order to cover off on the extra expenses during my low months. I feel the same way. In my case, I had a minimum amount of money that I *had to make* each month for my sanity. I couldn’t leave my job until I reached that point. I think another thing I would recommend to someone considering freelancing full time would be to get your ducks in a row in terms of credit lines and mortgages. Refinancing or getting a mortgage is tougher and more expensive when you’re self employed, so if you’re considering things like that in the near future, I’d recommend taking care of that before jumping ship. No, thankfully it doesn’t count against us that he was off work for a short time. And since he got paid for part of the training for the insurance job that didn’t work, there’s really only a month where he has a lapse of income. They’re just counting it like he moved from one job to the other. And, we’re also thankful that we’re looking for a cheaper house. They won’t count my income at all so we have to get a mortgage based solely on Greg’s. But, with Greg’s income, they said we can borrow up to 325Kish….which I think is crazy! But, we are going to have to pay a slightly higher interest rate…just because rates went up. Last time I checked (last week?) the rate on a 15 year on our area was 3.625. Our rate is 3.25 now so I’m not thrilled about that. But, unfortunately, that’s the price we pay for the whole situation. It could be worse! I wish I knew this when I started freelancing. I lost my job, had NO savings and some pretty hefty car payments, so it wasn’t pretty. Fortunately for me it worked out nicely in the end, but the first 2-3 months were horrible. Freelancing sounds exciting and terrifying! How did you decide how much money you needed to save before you took the plunge? I think the only way I would make the leap is if I lost my job. Given that, I do agree with having savings on top of emergency fund, and keeping your bills to a minimum. Also, I would create an “emergency budget” and figure out how long you could live BARE BONES. If it’s less than 12 months…..you’re not ready. Don’t quit your day job is sage advice for anyone trying to pursue some alternative form of work. I’ve always thought it prudent to know where your next income is coming from before turning away from your current job. I’ve not always done that though, and have tried the leap of faith several times. It generally works out, but it’s not the wisest move. Like any business, you should have some savings built up before starting freelancing because income is not immediate. They key is not to quit your job before you build the clientele. I’ve known people who hated their job and quit before they found another, the job market was brutal. Definitely limit your expenses. These are all great tips! Planning is always key. A leap of faith might have worked for some but that doesn’t mean you can just do it. It just makes sense to prepare and plan and when you’re ready then do it. Sounds like a wise idea to have all the things you mentioned before you start freelancing and eventually quit your job. You have to have a good money buffer. All great tips of course but I would add: Try living off half your income now while you are a full then employee, or at least drastically reduce your budget so you can feel what it might be like to take a huge pay cut. Yes, some of you guys are killing it freelancing (like Michelle) and won’t need to, but it;s something I wish I would have done so things aren’t a shock to the system. Great points Holly, I too think it is prudent to plan for the transition. I really like your idea of starting a bank account and put all your income from writing jobs in it. I think this will have a psychological advantage too, providing you confidence that hey, I can make a living at this. Such a great idea, thanks for sharing!